Check out this fabulous article by David Bornstein about Friends of the Children that was in the New York Times Opinionator section’s Fixes blog in October. They go to classrooms and look for children who are not just acting out aggressively like Samuel, but who are withdrawn, depressed or display a marked absence of emotion. They don’t just assess the family situation — many kids have a staggering array of challenges but also natural resilience — they look for children who are overwhelmed by their circumstances. And where most mentoring programs make connections that last from 9 to 18 months, Friends guarantees its children 12 years of continuous mentoring at least four hours every week with no summer breaks — typically beginning in kindergarten and extending until high school graduation. As the article mentions, mentoring programs are supported by everyone, including Republicans and Democrats. According to the article, mentoring programs can help kids stay in school and avoid violence and drug use. Anyone who works with severely traumatized kids isn’t surprised — basically, all it takes for most kids to lead healthy lives is to have healthy adults that support, nurture and love them. 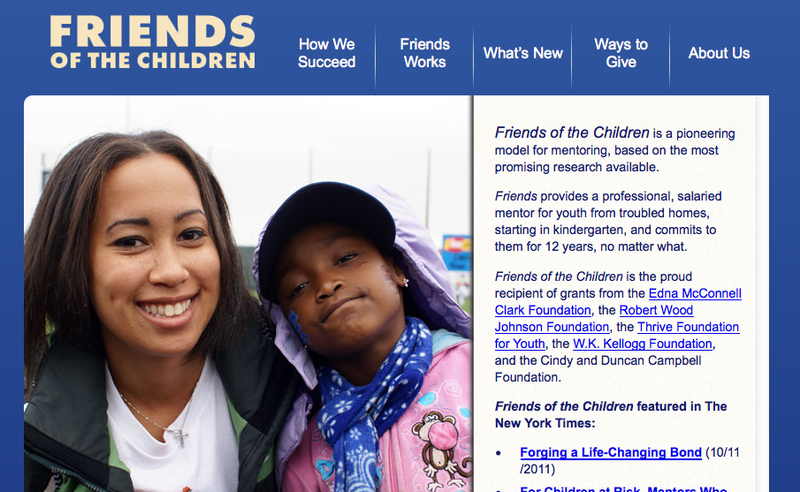 Friends of the Children recruits mentors who work full time, are paid and trained to handle kids who are in the throes of severe stress and have no skills to handle it. Stavisky’s quote brought to mind a conversation I had with a friend who’s a Cub Scouts leader in a community whose members are relatively well off. She and I have talked a lot about traumatized kids, so she recognized that a kid in the troop was showing signs of trauma. She knew also the family was having some real troubles, and it was obviously affecting this kid. But, she said, recognizing didn’t help the kid much, because, in her role as a Cub Scout leader, she had no idea how to be more effective in helping him. One reason why the CDC’s Adverse Childhood Experiences Study was so startling was that the 17,000 participants were middle and upper-middle class, mostly white and college educated. Not a demographic in which you’d expect to see a lot of child trauma. But there was. And is, as the 14 states around the U.S. that have done their own ACE Studies. So do you think it would be useful for our adult leaders in Girl Scouts, Brownies, Boy Scouts, Cub Scouts, 4H and youth church groups to learn about adverse childhood experiences? Would that help them become better equipped to offer the extra assistance to kids and families who haven’t yet disintegrated enough to come to the attention of child welfare services, school principals, the local police department’s domestic violence squad or juvenile justice, but whose kids are suffering nonetheless? Everyone knows that it is far more effective and cost-effective to help children develop in a healthy manner than to have to support or rehabilitate them as adults. But how much more cost-effective could it be? Mark Chussil, from Oregon (34) helped Friends put a dollar figure to the savings. He co-led a pro bono project through the Community Partners program of the Harvard Business School Association of Oregon which determined that for each child that Friends assisted, society would save $838,030 – roughly $715,000 more than the program costs — largely because the students are more likely to contribute to society than to become dependent on public resources or involved with crime.